In my first Mock Draft of the season, I put in quite a bit of trades, but this one I wanted to focus on the players in the draft and not really the trades. I know there will be tons of trades in this upcoming draft, but I made this draft with only 1 trade. Josh Rosen is on the move, but to what team? Find out below. 1.) Arizona Cardinals – Kyler Murray, QB, Oklahoma – Cardinals have been very obvious with this and I do not think it is a joke. 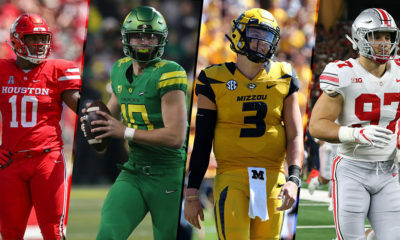 The Cardinals can pick up an additional draft pick by letting Josh Rosen go and I am sure they will have several bidders, and I feel they will have another draft pick coming up so stay tuned! 2.) 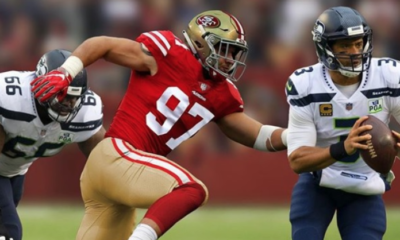 San Francisco 49ers – Nick Bosa, DE, Ohio State – The 49ers have added Dee Ford and Kwon Alexander at linebacker, they have one of the best pass rushers in the game with DeForest Buckner and they have Solomon Thomas but you cannot pass on Bosa. This front seven is going to be nasty, and that is what they want in San Fran. 3.) New York Jets – Quinnen Williams, DT, Alabama – The Jets make a ton of sense here, they do run the 3-4 type defense but that was under former head coach Todd Bowles, with Gregg Williams at the helm I expect this defense to be nasty and one way to make a nasty quick is stack the trenches. Quinnen Williams alongside Leonard Williams, Henry Anderson, Nathan Shepard and big Steve McClendon and the Jets are off! 4.) Oakland Raiders – Josh Allen, LB, Kentucky – The Raiders have been adding key pieces to their team this year, they added Antonio Brown and Vontaze Burfict and now they add one of the best linebacker prospects over the past decade. Allen is a solid player who can come in right away and play. The Raiders defense is going to be tough with Allen and Burfict at the linebacker position. 5.) Tampa Bay Buccaneers – D.K. Metcalf, WR, Ole Miss – I see everyone giving the Buccaneers a linebacker. They just signed Deone Bucannon and Shaquil Barrett to add to Lavonte David, they have a great group of linebackers and I do not feel that is their biggest need. They did lose Adam Humphries and Desean Jackson though. Imagine another big receiver with speed for Jameis Winston? Mike Evans, D.K. Metcalf and Chris Godwin sounds like an arsenal to me. 6.) New York Giants – Ed Oliver, DT, Houston – The Giants pass rush is horrible, and they need someone to help them out immediately. They are not in love with a quarterback early so they go best player available. Oliver will be a force in the NFL for years to come. This is the best player on the board at the time and someone that will make an impact from day one. Huge pick by the G-Men!. 7.) Jacksonville Jaguars – Jawaan Taylor, OT, Florida – The Jaguars have a brand new quarterback but they still have the same problem they did with Blake Bortles. They have a huge need on the offensive line. This move makes too much sense. You get yourself book ends for the quarterback to have a pocket. Taylor is another Florida player and the Jaguars love their Gators. 8.) 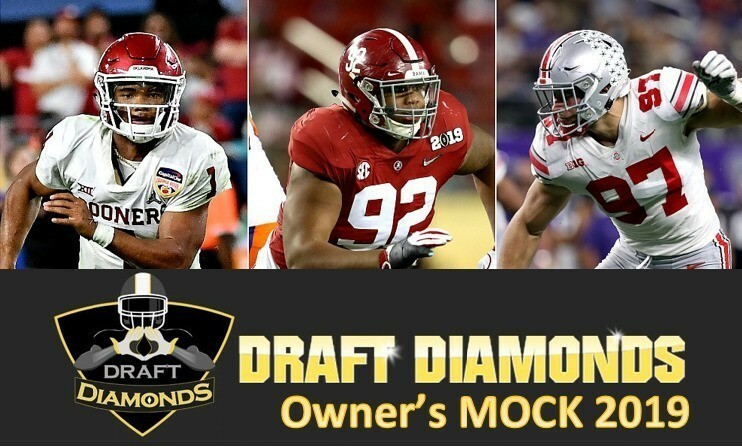 Detroit Lions – Montez Sweat, DE, Mississippi State – Lions did re-sign Romeo Okwara and they did give a huge paycheck to Trey Flowers, but I feel this is still their biggest need. They have other positions like cornerback but I am not sure there is a corner worthy of this pick right now. This is basically a best player available pick. 9.) 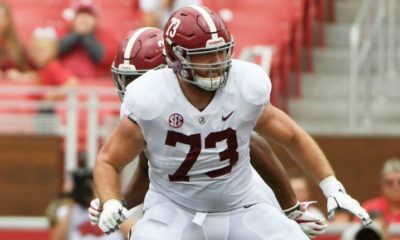 Buffalo Bills – Jonah Williams, OT, Alabama – Bills have been very clear this off-season adding tons of new additions to the offensive line. They want to keep Josh Allen protected and the best way to do that is add tons of competition to make sure you get a line that can keep Allen in the upward position. Jonah Williams is versatile and can play multiple positions. He also played under Bills OC Brian Daboll. 10.) Denver Broncos – TJ Hockenson, TE, Iowa – The Broncos need a tight end for Joe Flacco who had tons of them in Baltimore. The Broncos have a few but none are on the level of Hockenson. He can spread the field and block. This is a future All-Pro tight end in my opinion. 11.) Cincinnati Bengals – Devin White, LB, LSU – This is an absolute steal for the Bengals. They lose Vontaze Burfict but are sitting pretty to land either Devin White or Devin Bush. Devin White is the better of the two in my opinion and this is a downright steal at 11. Bengals have not been very active in free agency, but they hit a home run at pick 11. 12.) Green Bay Packers – Devin Bush, LB, Michigan – The Packers have a need at linebacker and Bush is just sitting there. This is a great pick or the Packers who do not have many options on their roster right now. This is a new Packers regime and they are going and getting the best players out there. They signed free agents on the defensive line and now pack up the front seven with a top tier linebacker prospect. 13.) Miami Dolphins – Dwayne Haskins, QB, Ohio State – The Dolphins were prepared to just go through the draft and run with Ryan Fitzpatrick but the football God did not want it to happen. Dwayne Haskins falls to the Phins at pick 13 and they run up to the podium. Haskins to the Phins at 13 is a bloody steal. 14.) Atlanta Falcons – Greedy Williams, CB, LSU – The Falcons may want a pass rusher here, but you cannot pass on Greedy Williams. The Falcons are in one of the best passing divisions in the NFL and to beat those teams you have to have a solid back-end. Greedy Williams and Trufant make a shut down pair and this move makes too much sense. 15.) Washington Redskins – Hakeem Butler, WR, Iowa State – The Redskins better get some weapons for their offense. They do not have many weapons, and Butler is the best wide receiver in the draft. He has size and speed. He is a big playmaker who will dominate the NFC East. 16.) Carolina Panthers – Andre Dillard, OT, Washington State – Dillard can play left or right and is super athletic. He is a huge player with a monster wingspan. He will help keep Cam Newton standing and that will help the Panthers out big time. This is a huge upgrade on their offensive line. 17.) 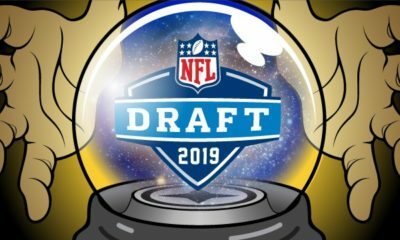 New York Giants – Drew Lock, QB, Missouri – The Giants passed on a quarterback early but they land who I feel is the best in the draft. They land a premium pass rusher and one of the best quarterback prospects in the draft. Drew will be the face of New York after the Eli era. 18.) Minnesota Vikings – Cody Ford, OG, Oklahoma – Cody Ford is an instant upgrade for the Vikings on their roster. They have Aviante Collins and Danny Isidore on their roster besides newly signed Josh Kline. This is an immediate starter for the Vikings for a decade. 19.) Tennessee Titans – Noah Fant, TE, Iowa – The Titans have one of the best all around rosters in the NFL in my opinion. They really do not have too many gaps. I think they go best player available here and you cannot knock them for going TE Noah Fant. 20.) Pittsburgh Steelers – Rashan Gary, DE, Michigan – The Steelers do not have too many areas of need. I could see a safety with Morgan Burnett likely to be traded or cut, but the Steelers have Edmunds as a back-up. I think Gary sitting there at 20 is the best player available and they are not wrong for taking a guy that can get to the quarterback. 21.) Seattle Seahawks – Christian Wilkins, DT, Clemson – Are you kidding me? Wilkins should not be on the board and he is. This is a pure BPA pick, and the Seahawks benefit greatly from the addition. Wilkins is added to a very solid defensive line group with Poona Ford, Naz Jones and Jarran Reed. 22.) Baltimore Ravens – A.J. Brown, WR, Ole Miss – The Ravens have Willie Snead and a bunch of other decent wide receivers. They need a player to go opposite of Snead if they want Lamar Jackson to succeed. Brown can block and has the potential to be a better receiver than Metcalf. 23.) Houston Texans – Dalton Risner, OL, Kansas State – You better protect Deshaun Watson, and this kid is one of my biggest draft sleepers. On and off the field is a great person, and really loves the game. The Texans get a monster steal here in Risner, who can play multiple positions. 24.) Oakland Raiders – Clelin Ferrell, DE, Clemson – Adding Josh Allen and Clelin Ferrell may sound like a misfire here for the Raiders but trust me this is how you replace a Khalil Mack. You add two young players who can get to the quarterback and who are on rookie contracts. I know it sounds crazy Raiders fans but trust me this is a great draft pick, many have him landing in the top 10 to top 15, at 24 this would be considered a steal. 25.) Philadelphia Eagles – Byron Murphy, CB, Washington – The Eagles land the second best cornerback in this draft. This could also be DeAndre Baker from Georgia, but Murphy is a better corner in my opinion. They re-signed Ronald Darby to a one year deal and Murphy will eventually be the replacement. They have a solid team but they lack depth at corner. 26.) Indianapolis Colts – Jeffery Simmons, DT, Mississippi State – His stock dropped because of his injury and past, but Colts are not afraid to add a talent like Simmons late. Chris Ballard will do his research on Simmons and select him, this is a huge addition as I feel he is a top 15 player without the injury and past history with law enforcement. 27.) Oakland Raiders – DeAndre Baker, CB, Georgia – The Raiders have already stacked their defensive front now they add a solid cornerback to replace Rahsaan Melvin who left in free agency. Baker and Conley are a sneaky solid duo at cornerback. 28.) Arizona Cardinals – (Trade) – Los Angeles Chargers – Irv Smith, TE, Alabama – The Chargers trade the 28th pick in the first round to land Josh Rosen. The Cardinals land one of the best pass catching tight ends in the NFL draft. Give your rookie quarterback targets. They signed Charles Clay and have Ricky Seals-Jones but Smith can be like a wide out in many sets because of his speed. 29.) Kansas City Chiefs – Dexter Lawrence, DL, Clemson – The Chiefs have some studs already on their defensive line but Lawrence brings versatility and a pass rush. This is a steal in my opinion as I feel he is a top 20 prospect. 30.) 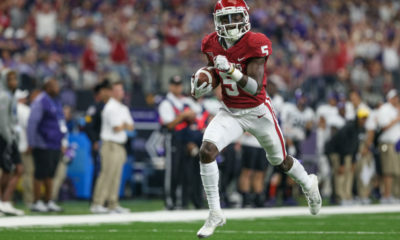 Green Bay Packers – Marquise Brown, WR, Oklahoma – Brown is arguably the best deep threat in the 2019 NFL Draft as a speedster with exceptional quickness and burst. He could play in the slot, and give the Packers a new weapon for A-Rod. 31.) Los Angeles Rams – Greg Little, OT, Ole Miss – The Rams find a replacement for Andrew a Whitworth who has been amazing. Little is considered a top tackle in the NFL draft and this is a great choice for the Rams. 32.) New England Patriots- Deionte Thompson, S, Alabama – The Patriots have Patrick Chung and Devin McCourty neither are young and Thompson could be a player who comes in with Duron Harmon to take over by the end of the season.